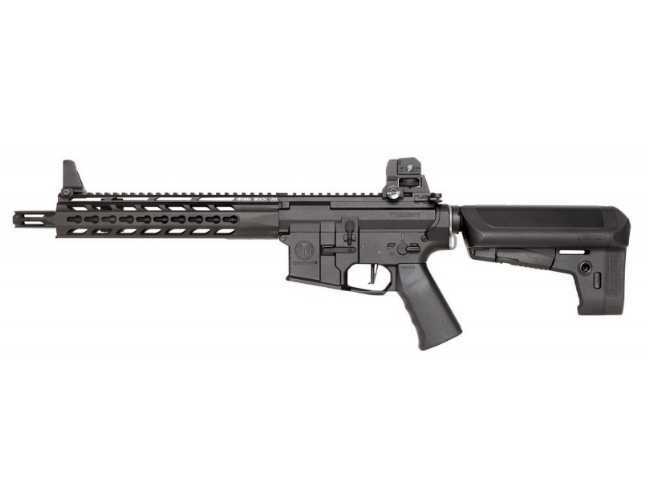 KRYTAC MK II TRIDENT CRB, BLACK. This M2 is used forf Cqb and Open ranges. guard. The special hand guard a tripod at the front that will steady the gun.The receivers feature a stamped logo and is a nice matte finish.Extra features include an 2 handed fire selector and a locking bolt that will give access to the hop up point. The hop-up has 15 adjustment modes and are numbered for reference. The stock also has 2 sling swivel divots as well as a loop for a sling The Trident CRB has the most modern shooting performance and has strong internals to give this performance.Comes with integrated MOSFET to regulate electronic fire contacts.Also,the gearbox shell has a window on the left side for lubrication or inspection Included is a modular spring guide system that is easy to change.The piston is made of a tough, lightweight polymer.The material for the gears are very strong and test figures bear this out.The Trident CRB is a superb multi-purpose Airsoft rifle and can perform in different scenarios at the top level. Threaded Barrel Yes - 14x1 CCW. Inner Barrel Length 280 mm. Hand-guard and Rail Length 25.4 cm / 10". Stock cab Adjust to 6 Positions. Overall Length 675 mm (26.5") - 787 mm (31"). IMOSFET to protect Trigger Contacts. Key-Mod rail system 3 different positions. KRYTAC Triden v2 Gearbox.Cornered Gearbox for strength. Gearbox with window for applying oil. Cylinder head with Rubber Bumper.